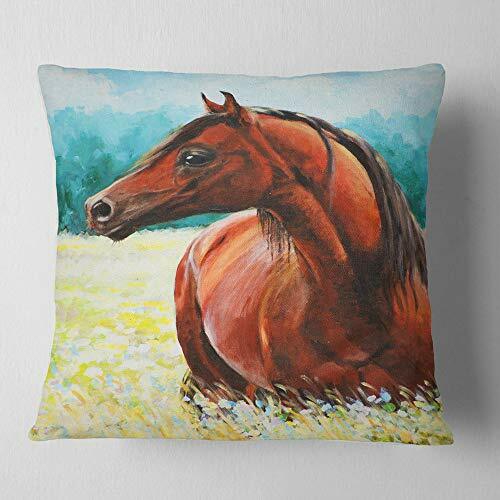 Designart CU13315-26-26 Brown Arabian Horse Painting' Abstract Throw Cushion Pillow Cover for Living Room, Sofa, 26" x 26"
these animals pillow is printed using high color density Italian inks to create a vibrantly colored, sharp artwork. Material: throw pillows cover is printed on 100 percent light weight polyester. Cushion filled with 100 percent polyester fill. Wrinkle resistant fabric. Down-like comfort - odorless. Pillow insert is 5 inches thickness and made in canada. Available in square, rectangle and circle shape. High Quality pillow insert + Cushion Cover Printed On Both Side. If you have any questions about this product by Designart, contact us by completing and submitting the form below. If you are looking for a specif part number, please include it with your message. Designart CU13288-26-26 Gray Arabian Horse Watercolor' Abstract Throw Cushion Pillow Cover for Living Room, Sofa, 26 in. x 26 in.